The SPLED-LEDEUL4 Solar Powered Underwater LED Light from Larson Electronics is a reliable lighting solution for remote areas, marine sites, underwater locations and industrial facilities. Charged by a solar panel, three 8aH sealed lead acid batteries provide constant, reliable power to the LED light. The system operates on 12V DC; and the LED light can be mounted underwater or above water, with the panel mounted above water. The SPLED-LEDEUL4 is a sustainable LED lighting solution for docks, marine locations and underwater lighting applications. Powered by solar panels, the compact unit operates on 12V DC and provides 800 lumens of colored illumination. This LED light features a small 4.25-inch diameter profile and is available in optional light colors including red, white, green, amber, blue and infrared. Two different colors can also be combined within a single fixture at an additional cost. This LED light is available in 10 degree spot or 60 degree flood configurations. Spot configurations are ideal for specialty applications, while flood configurations are very effective for general-area lighting. The solar-powered LED units are fully sealed, weatherproof and constructed of aluminum with stainless steel hardware for durability and corrosion resistance. This waterproof light is housed within a hard anodized and powder coated aluminum chassis that provides excellent strength and durability. Solar Panel Operation: The LED light runs for 15 hours when the batteries are fully charged. The sealed lead acid battery pack is contained within the solar panel, not the light. Charging time for the battery bank is 5 hours when exposed to direct sunlight. As with all solar powered equipment, charging time is affected by the amount of available ambient light. Indirect sunlight and low ambient light levels, such as on cloudy days, will extend the charge time. This solar panel is configured to operate non-stop 24/7, day/night with photocell, motion sensor for security purposes, on/off switch for manual operation, or flying leads for operators to connect to user provided external switches. The day/night and motion sensor is programmed to activate the solar panel in the evening and to shut it off during the day, activating the LED light when ambient lighting falls below 1 lux. The motion sensor will activate the panel upon detecting movement within range of the panel. 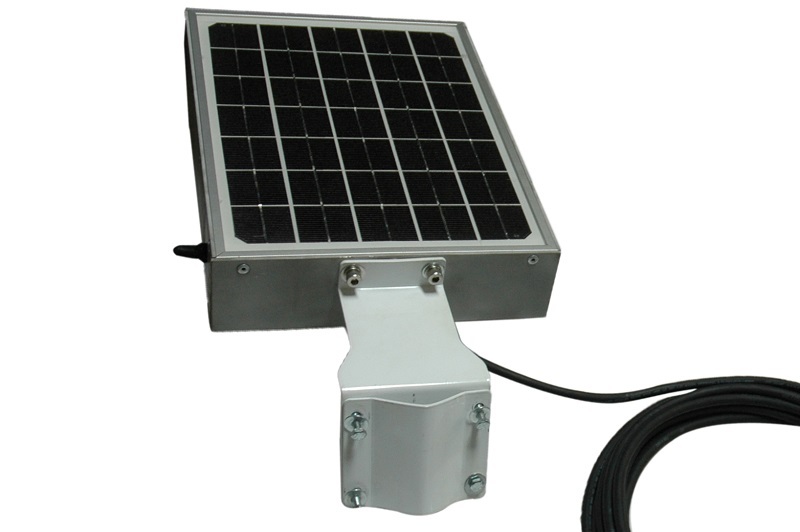 Wiring: This unit comes with 6` of SOOW cord and a Deutsch 2-pin disconnect that runs between the solar panel and the LED light, which offers operators convenience and flexibility during the mounting process. Custom lengths are available upon request. Please contact us for special requirements. Mounting: The SPLED-LEDEUL4 features the ability to attach the solar panel to above-water flat surfaces such as walls or round/square pole mounting such as on flagpoles or structure supports. The LED light can be mounted on flat surfaces, in both underwater or above-water environments.